Thank you for supporting our 2018 Native Plant Sale! See below for step-by-step planting tips and a video tutorial. Why a Fall Plant Sale? In 2016, the Land Trust held its first ever Fall Native Plant Sale. Due to its success we decided to transition our annual sale from spring to fall in order to offer nursery-grade plants at optimal planting time! Planting during the wetter fall months helps increase plant vigor by reducing transplant shock and watering requirements. Our native plant collection includes a variety of ground covers, shrubs, and trees. Native plants are best suited to our unique northwest environment. They are built to withstand our long wet winters, and our dry summers and are shown to be more resistant to disease. They require less maintenance overall and help improve habitat and water quality across the Island. View the full selection of plants below! Continue to water plants in pots prior to planting in the ground. Plant in ground mid-October through late-November when soil is moist and temperatures mild. This allows plants to get established in wetter months, removing the need for immediate watering. Watering may need to occur during the first couple of summers, especially if there is lack of precipitation. Dig holes two – three times bigger than the plant container size to loosen soil. Remove anything attached to the plant. This includes bamboo stake, tags, and twine. Remove the plant from pot by gently rolling the pot from side to side on the ground then tipping it upside down. Locate the root flare (outward curving base of plant where it joins roots). Don’t plant too high or too low, the root flare should sit right above ground level. A buried root flare will rot over time, leading to the failure of the plant. This is a very easy thing to avoid, but it can only be done at the time of planting. Loosen the roots. Straighten any circling / girdling / j-roots. It’s better to cut a root that’s circling than to leave it. Circling roots will continue to grow in that pattern, eventually strangling and killing the plant. Again, an easy thing to avoid that can only be done at the time of the planting. Dig hole only as deep as the root ball, 2-3 times wide. Note that digging the hole is not the first step! You want to know how deep the root ball is after you’ve loosened the roots and located the root flare. A hole that’s dug too deep means the plant will sink over time, burying the root flare. Do not loosen the soil at the bottom of your planting hole—this will prevent the tree from settling. Place the plant in the hole. Make sure root flare is above ground. Fill in the hole. Pack soil around plant firmly but not aggressively (no air pockets). Use the same soil from the hole to plant. Don’t add compost or fertilizer to the hole, which can actually kill the young plants and cause its roots to circle. Press out air pockets as you fill the hole. Water it in. If the soil is not saturated, watering helps eliminate excess air pockets and reduces the stress of transplanting. You shouldn’t have to water for the rest of winter. Mulch. Once you’ve planted, spread a nice layer of mulch around the base of the plants at 2-4’’ deep. Be sure to keep the mulch a hands-width away from the trunk and avoid mulch volcanos, which can rot the base of the plants. Provide water and mulch around plants for 2 to 3 years after planting to ensure their best chance for survival. After 3 years they should be well enough established to survive independently. Plants are listed alphabetically by common name. If you have questions, feel free to call us at (206) 842-1216! Photos: These photos by http://www.nwplants.com are licensed under a Creative Commons Attribution-ShareAlike 3.0 Unported License. At a Glance: Low-growing, creeping shrub with dark green holly-like leaves and slender spikes of yellow flowers. Height: Up to 2 feet tall. Fruits: Small rounded dark blue berries with a whitish bloom. Best Growing Conditions: Partly sunny to full shade; moist to dry soil. Why Choose Cascade Oregon Grape? A slower-growing species, it is especially well-suited to areas of dry shade, providing an attractive anchor for the border of a shady garden. Also ideal as a low maintenance ground cover or low hedge. One of the most common understory plants in the Pacific Northwest, various species of birds and mammals prefer the small berries produced by M. nervosa. Photo courtesy of DHochmayr || CC-BY-SA-3.0 and http://www.nwplants.com, licensed under a Creative Commons Attribution-ShareAlike 3.0 Unported License. At a Glance: Deciduous Groundcover. This wonderful groundcover prefers light shade and a nice organic soil. Attributes include attractive foliage, edible berries, beautiful white blooms, spreads slowly. Best Growing Conditions: Moist, organic soil, partial to full shade. Many gardeners place rotting wood at the bottom of the planting hole to provide suitable nutrients to thrive. At a Glance: Dark green fern leaves grow in tufts from short, stout rhizomes. Height: Up to 40 in. Leaves: Narrow, dark, glossy leaf with a wavy, crinkled edge along the leaf; the stalk is gloss black. Upright “flowering” stalks emerge from the center of the fern’s base. Best Growing Conditions: Deep shade and some moisture; plants in sun tend to grow smaller. Best Companions: Other woodland natives, such as Trillium ovatum (Western Trillium), Achlys triphylla (Vanilla Leaf), or other ferns. Why Choose Douglas Fir: These hardy trees can grow on most soils, often under conditions hostile to other conifers. They can be sheared back to form a large hedge and their cones are a favorite food of local wildlife. Description and photos courtesy of www.nwplants.com. At A Glance: The rhizomes spread slowly, eventually creating a 2-4 ft. wide clump. Tufts of 1-2 ft., sword-shaped, dark-evergreen leaves arise from the rhizome and surround a flowering stalk of equal height. Several showy iris blossoms emerge from leafy bracts atop the stalks. Flowers: Flower color ranges from light blue-violet to dark purple, occasionally white. Why Choose Douglas Iris? Being easy to grow and extremely long-lived (clumps have been found in the wild that are over 100 years old), the Douglas Iris should be in every native plant garden. Birds and butterflies will flock to this plant, a perfect choice for the garden in partial shade. Photos by http://www.nwplants.com are licensed under a Creative Commons Attribution-ShareAlike 3.0 Unported License. At a Glance: Beautiful foliage and edible fruit make this a must in most gardens; the new growth is bronze and the berries are blue to black; does not transplant well, but can be grown easily from smaller potted stock; can be hedged. Why Choose Evergreen Huckleberry? A favorite of local wildlife, the berries are consumed by many species of birds and mammals. The flowers attract a variety of butterflies as well as hummingbirds. The fruits can also be used for jams or in cooking, and are rich in vitamin C.
At A Glance: Attractive, fuzzy heart shaped leaves, spikes of greenish-white to reddish flowers. Slug resistant. Occasionally will spread aggressively. Evergreen during mild winters. Why Choose Fringecup? Fringecup makes an excellent ground cover as it spreads easily and looks fabulous en masse, and hummingbirds will thank you for the sweet nectar. The flower stems add height and an airy quality to composed flower bouquets. They are long lasting as well. At a Glance: Stately perennial from a deep bulb, producing spikes of large blue flowers in early spring. Flowers: Five or more deep blue (rarely white) flowers in a long terminal spike; size: 3.5 cm (1.4 in) long. Why Choose Great Camas? A true meadow plant, this Camas likes moisture in the winter and spring followed by a dry period in the summer. Camas will do well in sun or filtered shade and succeeds in heavy soils. At A Glance: Dense upright or arching branches create a round outline. Maple-like, deciduous foliage is colorful in fall. White, flat-topped clusters of flowers are followed by persistent red berries. Height: Up to 16 ft. Flowers & Foliage: Flat clusters of lacy, white flowers unfurl in May. Red autumn foliage stands out, as do the scarlet berries. Why Choose High Bush Cranberry? The edible berries are rich in Vitamin C and are sought out by many wildlife species. Berries and foliage provide beautiful fall colors that linger into early winter. At a Glance: A mat-forming evergreen shrub producing lovely pink flowers that later turn into red berries. The velvety red-brownish branches are long, flexible and rooting. Pure stands of kinnikinnick can grow to be very dense. Height: Up to 8 inches tall. Leaves: Oval in shape, dark green, shiny above and paler beneath with a leathery texture; up to 3 cm long. Flowers: Small pink bell-shaped flowers in few-flowered drooping terminal clusters; size: 5 mm long. Flowers emerge in March, April. Fruits: Kinnikinnick berries are called drupes and ripen late, continuing to stay on plants into winter. Why Choose Kinnickinnick? This is a great alternative to the dreaded English ivy! Have a place you hate to mow? A boring parking strip? A retaining wall or rockery that could use a cascade of green? Kinnikinnick is a great choice. It’s low maintenance, drought tolerant, and a pal to birds (like grosbeaks and hummingbirds) and insects (like bees and butterflies), providing sustenance long into the lean season of winter. At a Glance: Erect, loosely branched shrub with large fragrant white flowers. Height: Up to 10 feet. Best Growing Conditions: Full sun to moderate shade in moist, well-drained soils. Why Choose Mock Orange? Nectar attracts pollinator species such as hummingbirds and insects, while the seeds are consumed by various birds and mammals. Large, showy, and fragrant blooms make them excellent for ornamental purposes and are attractive in hedgerows. Photos courtesy of http://www.nwplants.com are licensed under a Creative Commons Attribution-ShareAlike 3.0 Unported License. At a Glance: Erect to spreading shrub up to 4 meters tall with clusters of white flowers. Height: Up to 13 feet (4 meters). Stems: Brown shredding peeling bark. Flowers: White, small, 5 petals, about 30 pink stamens; several to many in terminal, rounded clusters. Best Growing Conditions: Moist or wet soils in full sun to part shade. Forest edges, wetland edges, thickets, riparian corridors. Why Choose Ninebark? Persistent seed heads provide a food source for birds well into the winter. Once established, root systems are excellent at holding soil. Photo courtesy of the Washington Native Plant Society / Starflower Foundation Image Herbarium. At a Glance: Spreading shrub with a pair of prickles at the base of each leaf and large pink rose flowers. Flowers: Large, primarily pink flower borne singly or in pairs of 2-3 at the branch tips, appear through May and June. Conditions: Mostly sunny; moist – dry soil. Nootka rose is tolerant of a very wide range of conditions. Why Choose Nootka Rose? Pollen-seeking bees are attracted to this beautiful shrub, and the rosehips remain on the plant throughout winter, providing food for small mammals, birds, and insects. At a Glance: Deciduous shrub; large, white to cream, lilac-like flower plumes are dazzling in late spring to early summer gardens; the flowers then turn a tan to brown color and last on the plant through winter. Best Growing Conditions: Dry to moist soil, more tolerant to dry soils than most natives. Sun to shade. Why Choose Oceanspray? An under-utilized plant in the northwest garden, it does exceedingly well on dry slopes and at the edge of deciduous forests of alder and cascara, but can also stand alone as a feature plant in a garden or on the back border as a big, fountain-like cluster. Description from kingcounty.gov/GoNative. Photos by http://www.nwplants.com are licensed under a Creative Commons Attribution-ShareAlike 3.0 Unported License. Flowers: The branches become laden with brilliant white flowers in spring and sometimes again in late summer. The creamy-white flowers consist of four petal-like bracts, each 3” long. In the fall, the foliage is a pleasing yellow or red. Photos: Photos by http://www.nwplants.com are licensed under a Creative Commons Attribution-ShareAlike 3.0 Unported License. At a Glance: An attractive broadleaf evergreen with a twisting reddish trunk and irregular branches with an overall rounded outline. Height: Up to 100 feet. Stems: Young bark is chartreuse green and smooth while older bark is brownish-red with thin peeling scales. Leaves: The alternate, evergreen leaves are dark shiny green on top and whitish-green below. Additionally leaves are hairless and have a leathery texture. Flowers: The small pinkish-white, bell-shaped flowers are arranged in large drooping clusters and are fragrant; flowering in April. Fruits: Small, round, orange-red berries with a finely granular texture. Berries are approximately 1 cm across. Best Growing Conditions: dry, shallow soils in full sun. Tolerates partial shade. Why Choose Pacific Madrone? Beautiful broadleaf evergreen tree is attractive all year long. Supports multiple moth and butterfly species at both the larval and adult stages, and the berries are eaten by birds. Photo by http://www.nwplants.com is licensed under a Creative Commons Attribution-ShareAlike 3.0 Unported License. 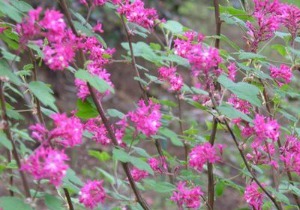 At a Glance: Showy shrub that can grow very large, with clusters of large pink flowers. Height: Up to 26 feet if grown in shade; shorter and bushier in sunlight. Leaves: Alternate, evergreen, leathery, thick, not hairy, oblong-elliptic, 8-20 cm (3-8 in) long; color: deep green. Conditions: Full sun to partly sunny; moist to dry soil. Why Choose Pacific Rhododendron? The clusters of eye-catching spring blooms are the main attraction. One of the showiest of our native shrubs, it adapts well to garden settings. It’s also our Washington state flower! At a Glance: Erect, multi-stemmed deciduous shrub with showy clusters of deep pink flowers in early spring. Flowers: In erect or drooping clusters of 10-20 flowers; pale pink to deep red; size: 3-10 mm long; shape: tubular. Flowers appear just prior to leaf emergence in February, March or April. Conditions: Full to mostly sunny; dry soil. Why Choose Red Flowering Currant? A harbinger of spring in the Pacific Northwest, blooms of Red Flowering Currant coincide with the northward migration of Rufous Hummingbirds, which follow the blooms up the Pacific Coast. Attractive to nectar-seeking insects and birds. Inedible whitish-blue berries darken to midnight blue at maturity, providing food for a variety of native birds and insects. At a glance: Deciduous shrub; small, white to pink urn-shaped flowers, followed by red, edible (and tasty) berries; often grows out of rotting stumps with salal. Why Choose Red Huckleberry? Tart berries can be collected and used for pies, jams, jellies, and other confections. The berries also provide food for a wide variety of birds and mammals. At a Glance: Deciduous shrub with a rounded, spreading form. Textured green, oval leaves in the spring are a striking contrast to the colorful bark. Why Choose Red Twig Dogwood? Provides beautiful year long color interest. Best used as a screen or shrub border. Easy to grow and adaptable in a variety of settings, including seasonally flooded areas, or near drain spouts. At a Glance: A delicate, evergreen herb with clover-like leaves and white to pink flowers, forming carpets in forested areas. Best Growing Conditions: Mostly shady to full shade; moist to dry soil. Why Choose Oregon Oxalis? Since it thrives in shade and will not grow in full sun, it makes an ideal groundcover for shady areas. The leaves contain oxalic acid, which makes them a tart and tasty treat in limited quantities. At a Glance: Creeping to erect shrub with hairy branching stems and dark leathery leaves. Height: Up to 16 feet in exceptional cases but typically 3-7 feet tall. Leaves: Evergreen, leathery, shiny dark green, egg shaped, 5-10 cm long. Flowers: Occur in horizontal rows of 5-15 white-to-pinkish, urn-shaped flowers, all oriented in same direction; size: 7-10 mm long. Fruits: What are commonly perceived as the berries are actually fleshy parts of the flower. They are edible and sweet, but can be pithy. The true fruit is a capsule surrounded by a rounded, reddish-blue to dark purple, fleshy husk; size: 6-10 mm wide. Conditions: Full sun to full shade; moist to dry soil. Why Choose Salal? One of the most common, robust, and culturally significant groundcovers of the Pacific Northwest. Use Salal under dense shade where most shrubs will not survive, or as a low-maintenance ground cover. Salal is extremely adaptable, thriving in sun, shade, humus, infertile, dry or moist soils. It requires little care once established. At a Glance: Medium-sized shrub to small tree producing fragrant white flowers in late spring and edible berries that ripen in early summer. Height: Up to 15 feet (4.5 meters). Fruits: The berry-like fruits are called pomes. Fruits start to form soon after flowers fade. Color: initially dull-red, turning dark purple/black with a white bloom. Best Growing Conditions: Full to partly sunny; Moist/Dry soil. Why Choose Serviceberry? This handsome shrub has outstanding blue-green foliage, delicate 2” flower clusters and brilliant red and yellow fall color. The pea size, purple fruits make fantastic pies and preserves. They were highly esteemed by Native groups and used to improve the flavor of less desirable berries. Not only humans love these fruit – wildlife of all varieties will come for a taste! At a glance: Generally a smaller to mid size tree, often sprawling and irregular in its youth and rarely achieving a full height or straight form; this pine is rather dark in color, both in leaf color and bark; needles are in pairs and tend to be shorter than many pine relatives; the small pine nuts are favored by many birds; it is one of the best pines for making unpruned hedges or visual screens; it is highly adaptable to many soil conditions, wet or dry. Height: Usually a small tree, though it can reach 50’ with intricate branching forms. Why Choose Shore Pine? It is fantastic in a small garden or as a hedge. A quick way to establish a native garden framework from bare ground is to plant a variety of small to large Shore pines. Photo ©2008 Walter Siegmund || CC-BY-SA-3.0 is licensed under a Creative Commons Attribution-ShareAlike 3.0 Unported License. Best Companions: Red dogwood, low Oregon grape, red alder, in fields of grasses and fuchsias. Work best in masses, or mixed with several other plants of similar height. Why Choose Snowberry? Snowberry is unlike almost any other plant in the world, as few plants have such white berries. It is a delicate looking plant with a quietly enchanting quality. Small clusters of pink flowers in the spring become the egg-white berries of late summer which last on the plant until nearly spring, offering spectacular fall and winter interest. Berries are not edible, but do provide food for wildlife. At a Glance: A large attractive fern with erect evergreen fronds forming a circular crown. Height: 3-5 feet (1-1.5 meters). Flowers: Produces spores on the underside of leaflets located halfway between the mid-vein and the margin in rows of two. Best Growing Conditions: Mostly to full shade; moist to dry soil. Why Choose Sword Fern? This is a plant that will stay green through all the elements. A tall, hearty, and handsome plant of the Pacific Northwest, it makes a great addition to any garden as a background for colorful flowering plants or to add bright foliage to out-of-the-way places. A surprisingly well developed root system helps stabilize soil on slopes. At a glance: Evergreen shrub; has 5-9 leaflets; grows by spreading from underground roots; bright yellow clustered flowers followed by purple fruits; blooms in spring. Best Growing Conditions: Partial to full sun, moist to dry soil; adapted to dry, open, rocky habitats but handles shade and moisture as well. Why Choose Tall Oregon Grape? Rugged in appearance, it looks best planted with shorter plants around it, and holly-like leaves make it an excellent barrier hedge. At a Glance: Tall, erect, multi-trunked shrub or small tree with sprawling branches. Stems: Bark is initially smooth and bright green, eventually turning brown with age. Leaves: Size: 5-12 cm (2-5 in) across. Leaves are green in spring; in early fall they turn orange-red or red in full sun or golden in the shade. Fruits: The fruit is a two-seeded winged fruit called a samara. Size: 2-4 cm (0.8-2 in) long; color: fruits are initially green then later turn a reddish-brown. Best Growing Conditions: Partly sunny/mostly shady; wet to moist soil. Why Choose Vine Maple? This elegant tree grows quickly to 10-15′ with multiple trunks and spreads to 20′ widths, much like a vine. Brilliant red and orange colors signal the arrival of autumn, while showy white flowers appear in early spring. Every bit as decorative as Japanese maples, these trees have an added bonus of providing local wildlife with food. Vine Maples like moisture and but will tolerate summer drought once established. At A Glance: One of the most stunning, native flowering shrubs in the Pacific northwest, the Western Azalea is deciduous and grows in an open form with multiple stems. Flowers: Flower variations include mixtures of pale pink, deep pink, and yellow-orange. Why Choose Western Azalea? Showy, fragrant white to pink flower clusters open in June through July. They are reminiscent of day lilies and emit a wonderful fragrance that travels for a considerable distance. Photos by: Walter Siegmund, Licensed under CC BY-SA 3.0 via Wikimedia Commons and by http://www.nwplants.com under a Creative Commons Attribution-ShareAlike 3.0 Unported License. At a Glance: Large conifer with branches that droop and then turn back up (J-shaped), broad crowns. Leaves: Leaves are scale-like, arranged in flat opposite pairs, overlapping shingled arrangement, die and shed after 3-4 years. Size: 2 mm long; color: yellowish-green with glossy luster. Best Growing Conditions: thrives in moist to wet soils with part to mostly shade. Prefers nutrient-rich soils with poor drainage. At a Glance: Attractive duck’s foot shaped leaves and beautiful white shooting star-like flowers; spreads by rhizomes, but not a bully. Why Choose Inside-Out Flower? A delicately showy flower, V. hexandra grows well in dry, shady areas of gardens. Spreading by underground rhizomes, it will easily fill a space and is best used to fill between taller, larger plants. Keeping it on the dry side will slow its spreading pace.